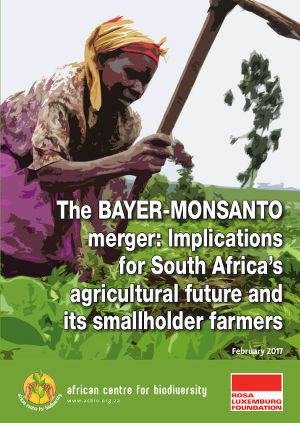 ACB explains how the Monsanto-Bayer merger is happening against the backdrop of other mega-mergers also consolidating the agrochemical and seed markets, including genetically modified seed markets. Six agro chemical giants will soon become three, as US chemical giants Dow and DuPont merge in a deal estimated to be worth US$130 billion, and China National Chemical Corporation (ChemChina) and Swiss-based Syngenta merge in a deal worth around US$43 billion. According to the report, if all the mergers are approved, three corporations will control 60% of the global commercial seed market and 64% of the agrochemical market. The corporations will also be able to claim “too big to fail” status, setting the stage for future bailouts using public resources, and further reducing accountability and opportunities for democratic control of the food system. ACB points out that these mergers will further push integration between seed and agrochemical market. It will restrict farmers’ choices about what crops they plant and what inputs they use. This model of production will deepen inequality, threaten the integrity of land and water resources, and decrease agricultural biodiversity. With the full support of AGRA Watch, ACB calls on the South African Competition Commission to reject the merger. They also call of the South African government to rein in the power of corporations and to commit resources towards decentralised R&D in partnership with farmers and consumers for more democratic and sustainable agricultural development. Download and read the full report PDF. Posted in ACBio, Bayer, Monsanto, Reports, South Africa and tagged agra.